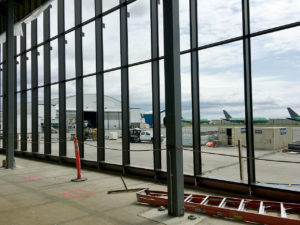 Goldfinch Bros., Inc. recently installed curtain wall for the passenger terminal at Paine Field in Everett. The project, which is on schedule, is showing progress toward completion. The two-gate terminal will have up to 24 daily departures from Everett offered by Alaska Airlines, United Airlines, and Southwest Airlines. GBI was very excited to be a part of this local project.